******** BIG SAVINGS ON SHIPPING FOR MULTIPLE PURCHASES!!! (In order to receive shipping discount, please ensure to pay for multiple items in single payment). Vinyl 12"/reel to reel-- $5.50 for the first disc, $1 for each thereafter. Doubles count as 2, triples as 3, etc. CDs / 7" Vinyl / Cassettes / 8-tracks / DVDs --- $5 for the first disc, 50 cents for each thereafter. Doubles count as 2, triples as 3, etc. Vinyl 12"/reel to reel --- $20US for the first disc, $6 US for each thereafter. Doubles count as 2, triples as 3, etc. CDs / 7" Vinyl / Cassettes / 8-tracks / DVDs --- $15 US for the first disc, $5 for each thereafter. Doubles count as 2, triples as 3, etc. Vinyl 12"/reel to reels ---$24 US for the first disc, $7 US for each thereafter. Doubles count as 2, triples as 3, etc. CDs / 7" Vinyl / Cassettes / 8-tracks / DVDs --- $20 US for the first disc, $6 US for each thereafter. Doubles count as 2, triples as 3, etc. Vinyl 12"/reel to reel ---$26 US for the first disc, $8 US for each thereafter. Doubles count as 2, triples as 3, etc. Box Sets with heavier books subject to additional fee. Returns are accepted if contacted within 3 days or receipt. Shipping is not refundable. Items must be returned in received condition. Sealed items are not returnable if they have been opened (even if they show damage when unsealed). GUARANTEED ORIGINAL US STEREO RELEASE; top seam is split, but looks to be easily repairable; FAST SHIPPING!!! 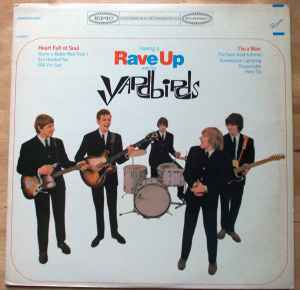 check out my other Yardbirds!